There is a picture that hangs in my home Lodge. It is a portrait of George Washington looking stately in his finest Masonic attire. It's a reproduction of a painting you've probably seen. 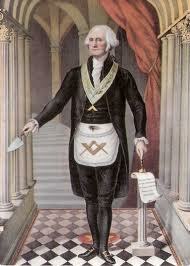 In it Brother Washington stands erect with a trowel in his right hand, wearing his Master Mason's apron, and the Worshipful Master's jewel around his neck. I sometimes look at that picture and wonder what it would have been like to sit in Lodge with him. I imagine the other Brothers similarly dressed in the fine attire of the day, conducting business and fluent in ritual. So I attended a Lodge meeting last night. I went to a Lodge which had the same picture hanging on its wall. There stood George, attired in a manner which reflected a seriousness of purpose and respect for his Brothers and the fraternity. I imagined sitting there as he called the Lodge to order; and then suddenly, almost ruthlessly, I popped back to reality as the Master of the Lodge I was attending did the same. "BRETHREN," he boomed, "you will say the pledge of... uh, no... you will join in the saying of the Pledge of Allegiance to... is that right?" Making up for the fact that he couldn't even stumble through the first line in the opening ritual was the uninspiring fact that he was dressed in cut-off jeans and a T-shirt. Adding a pork-pie hat to his ensemble, along with his slight frame, he had me convinced I was staring at Pee Wee Herman in his skivvies. Now, don't get me wrong. It was 95° outside and that Lodge's air conditioning was struggling. I'm not advocating we should all be standing there in tuxedos suffering starch-induced prickly heat; but I couldn't help wondering what George would think. For the record, I was wearing a golf-shirt and dress slacks. That's a far cry from formal attire, but at least, given present day fashions, I don't think it was insulting to the Brethren or the fraternity. (When I wear a golf shirt, the only thing it really insults is the game of golf itself). I know all Lodges aren't like the one I was attending; but at the expense of sounding like the curmudgeon I proudly am, couldn't we at least upgrade to business-casual? Maybe a new pair of jeans instead of the ones you inherited from you grandfather? In case you're still with me and still in agreement, I think there was something even more unsettling about last night. That first line of the ritual was one of the WM's better efforts. The Brother stood in the East and butchered almost every line as others in the Masonic Peanut Gallery, asked or not, called out the proper wording — or close to it — to help him plod along. The opening and closing went excruciatingly slow, extending what should have been an efficient meeting well into the evening. And we wonder why Lodge attendance is down. I guess, Brothers, if we can't dress in somewhat appropriate attire for meetings, maybe it's just a sign of the times and we shouldn't worry too much about it. But, for God's sake, and for the sake of accelerating meetings beyond a snail's pace, learn the ritual. Were he with us today, I'm sure WB George would recommend it. I'm left wondering a couple of things. 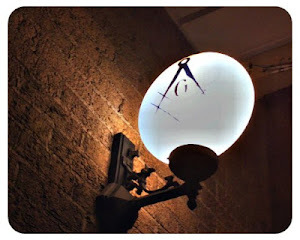 First, most lodges are dark during the hotter summer months - why was this one meeting in July? Second, was the "WM" the actual WM or one of the other line officers pressed into service and jumping one or more chairs for the evening? Everyone learns ritual differently, but I can say from my experience as an Associate Bethel Guardian with Job's Daughters that when someone KNOWS the ritual well, the meeting takes about HALF as long as when they are constantly being prompted. Is it not for the brothers of that lodge to take the individual aside quietly and remind him of the expected appropriate dress? My only question is, where are the Past Masters?